Help us preserve the Washington Kerchief! The Washington Kerchief (1776 or 1777) – “George Washington, Esq. 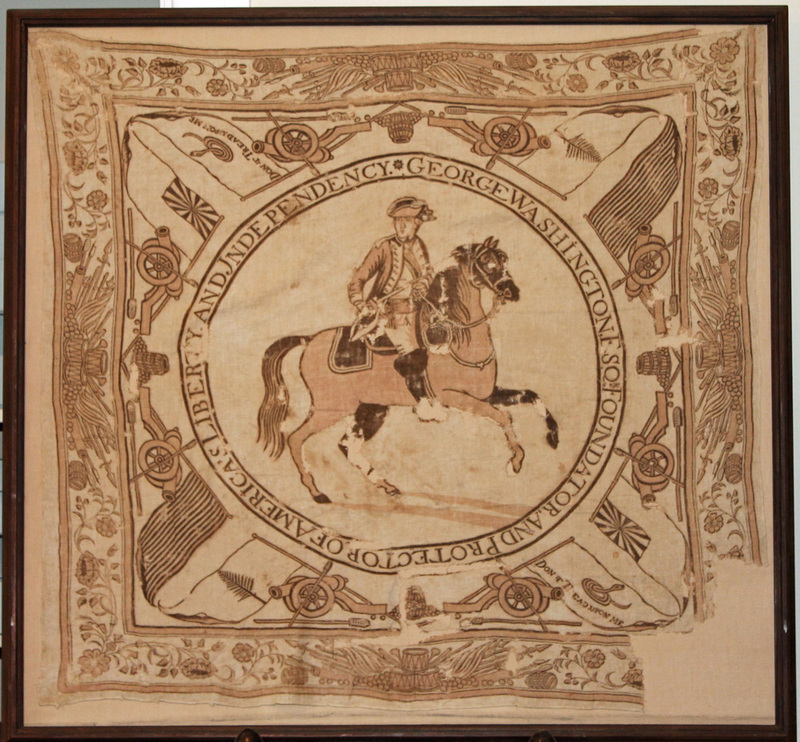 Foundator and Protector of America’s Liberty and Jndependency.” The wording (“Independency”) and the lack of the Stars and Stripes suggests that that this kerchief was made sometime between the Declaration of Independence in July 1776 and the adoption of the Flag in June 1777. It is believed to have been made by Joseph Hewson of Philadelphia at the request of Martha Washington, as a means of bolstering Washington’s status as military commander. It is considered to be the first piece of American political propaganda. The damage to the textile was caused by deterioration resulting from the caustic red dyes. Because so few kerchiefs were made, and because of their fragile nature, only five are now known to exist – two in the collections of the Winterthur Museum in Wilmington, DE, one in a private collection, and one that belongs to the New-York Historical Society – as well as this one. All of these artifacts are on display now in our 100th Anniversary exhibit, The History of Needham in 100 Objects. Your generous support can help to these rare and precious textiles for the next 100 years.